Unemployment is threatening our social fabric and creating unrest. 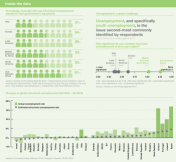 What can governments and businesses do to ensure career opportunities for young people? The fact that governments and businesses are acknowledging these concerns gives me reason to be optimistic, particularly in the West. The latest Pew Research Center data shows that lack of employment opportunities consistently comes out top when people in North America and Europe are asked which issue the government should tackle first. But to make a change we need to follow that realisation with real innovation and investment, working across borders, all around the world. This isn’t a national problem, so it’s essential that governments and the private sector take a global view of unemployment and resist tendencies toward protectionism. In this respect globalisation has already given us many gains. In India alone, millions of jobs have been created and the middle class has grown from 30 million people to 300 million in my lifetime. The IT sector, where I work, employs 2.2 million directly and 8 million indirectly. That’s a good start, but in a country of 1.2 billion people with about 11 million unemployed, it’s a drop in the ocean. Governments must create regulatory structures that encourage employment and economic stability, first of all incentivising companies to create jobs and then to invest in their workers. This investment is essential because people can no longer expect the guarantee of lifetime employment; a person who is employable today may well not be employable in four years, unless their employer invests in them or they invest in themselves. Workers today are competing in a global environment and that means they need quality education, schooling in soft skills and opportunities for retraining. The solutions required vary in every region around the world. The US talks about having 8.5% unemployment, but unemployment is only 3.5% in the technology sector, so there’s an opportunity there for more technology jobs to be created and more people to retrain. Europe, meanwhile, has a serious shortage of talent in healthcare, a sector that will always be needed. India’s unique challenge relates to the fact that given the size of the population, any solution needs to be implemented on an enormous scale. We may have three million graduates a year, including one million engineers, but only 25% are considered directly employable. The others need more training to make them industry-ready. Meanwhile, some 16 million Indian children are not in schools at all. India is working on it, but the results will take time. This is where I see potential for innovation. Enterprises should take part in the fight against youth unemployment, by training and mentoring young people in roles that offer career opportunities and eventually by hiring some of them in a full-time role, or at least assisting with their placement in another company. People, particularly the youth, need to be productively employed or we will witness the deterioration of our social fabric. I think it’s our responsibility to create opportunities like this. Technology and the efficiencies it brings are too often blamed for unemployment, but jobs are not disappearing. They’re evolving. Losses in one sector often mean gains in another; for example at the airport I now check in at an automated kiosk. That may be a job loss for counter agents, but think of the thousands who worked to create that check-in software. We are all custodians of social wealth. No institution or agency can do this alone. That’s where organisations like the World Economic Forum can help, by providing a global platform for exchanging ideas and innovation. This is going to be a long journey, but if we work at it together I can only see progress ahead.